UPDATE, SATURDAY, 2.15PM: According to the Bureau of Meteorology, a trough is extending from Ex Tropical Cyclone Oswald to the southern Capricornia coast as Ex Tropical Cyclone Oswald moves slowly over the Central Highlands and Coalfields district before it shifts south southeast tomorrow. Damaging winds, with peak gusts of around 100km/h are possible over the Wide Bay and Burnett. The bureau received reports of a tornado occurring through Bargara (near Bundaberg) at around 1pm today. Heavy rainfall which may lead to flash flooding is expected over the Wide Bay and Burnett with six-hour rainfall accumulations in excess of 100mm likely, particularly during Sunday. This could lead to rapid river and stream rises with 24 hour rainfall accumulations in excess of 250mm are likely. Currently, the heaviest rain is located on radar over the Southern Capricornia district and through northern stretches of the Wide Bay and Burnett district. Areas near Gladstone and south to Bundaberg have recorded 200 to 500mm in the 24 hours to 9am Saturday. Some areas through the southern Capricornia have now recorded close to 900mm over the past 48 hours. Water levels on the morning high tides are likely to exceed the highest tide of the year about coastal and island locations from Burnett Heads to the New South Wales border during Sunday and Monday. The sea level is likely to rise above the normal tide and the exposed beaches will experience damaging waves and flooding of some low lying areas close to the shoreline. Dangerous surf conditions, with significant beach erosion, are expected to develop along the coast from Burnett Heads to the New South Wales border from today, but particularly Sunday and Monday. Flood warnings are current in affected areas. UPDATE, 4.45PM: Residents near Windemere Rd have reported flooding on parts of the road but the road is not cut off at this stage. UPDATE, 2PM: The Tilt Train will be out of action for about three days because of the wet weather. For more information, call Queensland Rail on 1800 872 467. UPDATE, 12.20PM: As the result of the effects of the monsoonal trough and the low pressure system (ex-tropical cyclone Oswald) that currently extends from the Mackay area to the Fraser Coast and the future movement of that trough -the Bundaberg Local Disaster co-ordinator Peter Byrne has advised that the Local Disaster Management Group (LDMG) will now move to the activation level of alert. 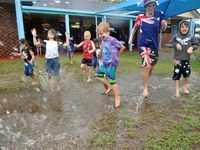 It is predicted that extensive rainfall will fall in the catchment areas of the Burnett River and effect coastal streams and rivers. Flooding and localised flash flooding could eventuate. Gale force winds associated with the trough are also expected. The LDMG core group (comprising primarily the emergency services) will meet this afternoon in regards this weather event. UPDATE, 12.05PM: The Bureau of Meteorology reported that at 10am, ex tropical Cyclone Oswald was located over the central interior of Queensland around 50km east of Moranbah and moving south southeast at around 15km/h. A trough extends from ex tropical Cyclone Oswald to the southern Capricornia coast. The trough and low are expected to continue moving south, reaching southeast districts on Sunday. Damaging winds, with peak gusts of around 90km/h are possible over the Wide Bay and Burnett and northern stretches of the Darling Downs and Granite Belt district today, particularly over higher ground and near the coast. Heavy rainfall which may lead to flash flooding is expected over the Wide Bay and Burnett district and areas of the Southeast Coast district north of Brisbane today, extending through remaining parts of the Southeast Coast district late tonight or early Saturday. Twenty-four hour totals of in excess of 200mm are likely. Areas from Fraser Island to the New South Wales border and west to the Great Dividing Range are likely to be affected, particularly coastal locations and the hinterland. Currently, the heaviest rain is located on radar over the Capricornia district and is extending south into northern stretches of the Wide Bay and Burnett district. Areas near Rockhampton recorded in excess of 550mm in the 24 hours to 9am this morning. Water levels on the high tide are likely to exceed the highest tide of the year about coastal and island locations from Burnett Heads to the New South Wales border during Saturday and Sunday. The sea is likely to rise to a level above the normal tide and the exposed beaches will experience damaging waves and flooding of some low lying areas close to the shoreline. 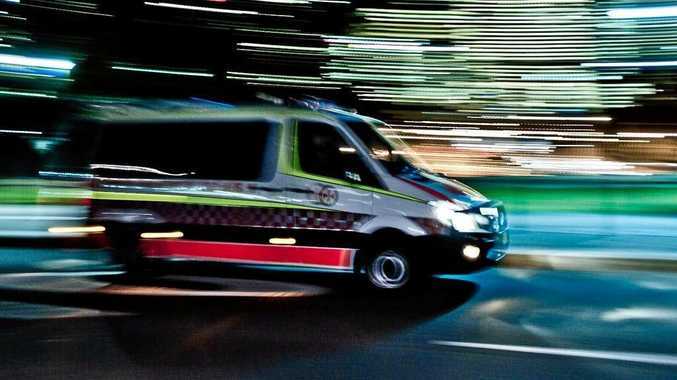 Dangerous surf conditions, with some beach erosion, are expected to develop along the coast from Burnett Heads to the New South Wales border from Saturday, particularly late Sunday and Monday. EARLIER, 7.15AM: According to the Bureau of Meteorology, at 4am, ex-tropical cyclone Oswald was located over land, approximately 120km west of Mackay and moving south-southeast at about 12k per hour. The monsoon trough extended from the southern Gulf of Carpentaria to ex-tropical cyclone Oswald and then to the east coast near Fraser Island. Damaging winds with gusts to 90km/hr are possible over the Central Coast, Capricornia and Wide Bay and Burnett districts. Areas that may be affected include islands and coastal locations between the Whitsundays and Sandy Cape. Heavy rainfall which may lead to flash flooding is likely over the Capricornia, Wide Bay and Burnett, eastern parts of the Central Highlands and Coalfields, and northern parts of the Southeast Coast district, possibly reaching areas north of Brisbane late in the day. Areas between St Lawrence and Brisbane, and inland to about Emerald may be affected. Six-hour rainfall accumulations of 100 to 200mm are possible. At around 1am today, severe flash flooding was reported in the Yeppoon area where rainfall of 271mm has been recorded since 9am Thursday. Flood Warnings are current for various rivers and streams in these districts. The next warning is due to be issued by 11.15 am. EARLIER: Local authorities are urging Bundaberg residents to be vigilant and prepare now as heavy rain is expected to continue into the weekend with possible winds up to 125km/h anticipated from tomorrow morning. Bureau of Meteorology Senior Forecaster, Pradeep Singh said it's going to be cloudy and rainy all weekend. "It doesn't look good at this stage," he said. "We're expecting 300-500mm on coastal areas, probably more - this is quite massive," he said. Disaster Management Committee Deputy Chairman and Deputy Mayor David Batt said the committee is currently on a watching brief. "We're keeping an eye out over the next 24 hours on what's happening," Cr Batt said. "If it does stay coastal, we're looking at localised flooding and possibly some temporary road cuts." Mr Singh said the rain is associated with the low, caused by ex tropical cyclone Oswale. "A monsoon system is coming southwards and brining lots of rain," he said. The bureau said the rain is expected to hang around for the next two to three days with the addition of wind coming tomorrow. "Strong to near gale force winds on the coast - up to 100-125km/h wind gusts are expected with the low. They should start to happen tomorrow morning - stay out of the waters." Mr Sing said flooding is a concern for the region. "Flash flood will happen," he said. "Heavy rainfall will occur close to the coast and should drain quickly to the sea." The bureau predicts the rain will ease heading inland, but could still cause problems. "Further inland there is a possibility of rivers and creeks rising," he said. Cr Batt said if there are any weather changes they will get information out as soon as possible. Authorities are urging residents in the region to be prepared and heed the usual warnings. "Keep a three day supply in case you go get blocked and clean gutters," Cr Batt said. "Winds over 100km/h are a possibility - tie down anything that could get blown away, move it to the shed or inside. "Move it now while it's not windy, in case we do get winds tomorrow - prepare early." Bundaberg SES local controller Bill Daniells urged people to follow all the weather warnings. "If we do get any flash flooding, we advise people not to drive in flood waters," he said. "Secure any loose objects, anything that might become a projectile in the wind. "Keep away from fallen power lines, if you see any fallen lines call Ergon on 13 16 70." Resident across the region are urged to heed the warning of authorities, be prepared and check for media updates. Rain and winds should start to ease off from Monday. Anticipated total: 300 - 500 mm plus. EARLIER: Rainfall totals of up to 250mm have been recorded since 9am yesterday within the warning area including Bundaberg. The heaviest rainfall is currently falling between Mackay and Bundaberg. The rain is forecast to move south during Thursday and Friday, with localised totals of 200-300mm possible each day. Fast river and creek rises are occurring or expected in the coastal rivers and streams within the warning area. A severe weather warning for heavy rainfall is current for the warning area. EARLIER: At this stage, Tablelands Rd has not closed due to flooding, despite reports to the contrary. 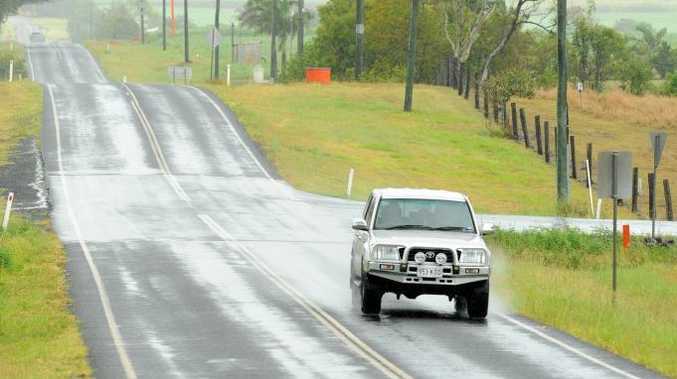 Heavy rains are predicted throughout the day in the Bundaberg region.